At age 2 ½ she was given her first formal piano lessons by her mother. At age 5 she played Chopin Concerts in public. At age 6 she gave piano lessons. At age 8 she was the official organist at St Charles’s Church in Tunapuna. She passed her first piano exams with honours and showed much promise. Her father was a chemist and Winnie later also became a qualified chemist. In 1940, according to Australian Actor Stuart Wagstaff, she entertained troops of the British Fleet Air Arm every Saturday night at Piarco and earned 1 pound per night. She also wrote song lyrics for Stuart many years later when she was living in her flat at Elizabeth Bay, Sydney. The Air Arm guys bet her once that she couldn’t play Boogie, but determinedly she worked out an eight-beat routine which she called “Piarco Boogie” that was later retitled “Five Finger Boogie” and went on to become her first Phillips Record Company release. In 1945 she left Trinidad for New York where she spent six months study before sailing for England. She became very close friends with Lord David Pitt, his wife Dorothy, and their children Bruce and Mandy. She married her husband Lou Levisohn in 1947. She visited many agents in London in search of work and one day she was sent for by The Bernard Delfont Agency who were putting on a Charity Concert at the London Coliseum when star Carol Lynne had to fall out of the bill at the last moment. She replaced Ms Lynne and was an instant success with the audience. However, although she had a lot to still learn about stagecraft, the very next morning she was signed to a long term contract by the agency. For several weeks, Winnie underwent a process of being groomed in stagecraft and worked hard to get a good act together. In the process she learned how to walk on and off the stage with poise and assurance, make her announcements with the right amount of interest and how to introduce a little “patter” into the act. In 1950, she gave a concert at Eastbourne where she started playing to and with her audience. She had basically become obliged to modify her earlier intention of playing only the classics and started to include lighter music like show selections and popular hits in her act. She come to find that the occasional boogie number went down best of all with her audiences, so she gradually played more of that kind of music. Winnie continued to experiment with her act, and put in different numbers every night until she found what audiences liked best. She became very successful and went on to do a round-the-country tour of variety theatres. Later (?) she made her first broadcast and appeared in cabaret at the Bagatelle Restaurant where Edmundo Ros was in residence who gave her the good advice to play commercially. She made her first record in April 1951 for Decca and her second “Jezebel” reached the Top 10. By now Winnie had climbed to about third position in theatre bills, and some weeks even played second top. In September 1951, she recorded her first hit record called The Black and White Rag on a 70-year-old upright piano, which her husband Lou purchased for 50 shillings. The record sold 30,000 copies in just 10 days and has gone on over time to sell millions. 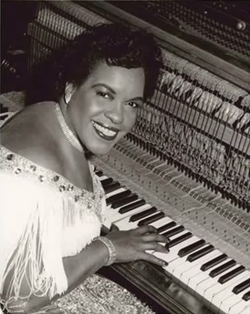 The parlour upright was termed her “other piano,” and by the time Winnie flew to Trinidad in December 1951 for a tour, she had signed her first contract giving her top billing for a show called “Rhythm is our Business,” which toured from 1952. The “Rhythm is our Business” show proved a great personal triumph for Winnie because now she no longer relied upon any other star to bring in the audiences because – she was THE STAR. Following “The Rhythm is our Business” show coming to an end she was offered a booking at the London Palladium in August 1952 – which was the dream of every variety artiste. Colin Bailey was appointed as her drummer sometime throughout the 1950’s (Probably 1952). Colin had his first engagement with Winnie at the Arcadia Theatre in Skegness straight after an earlier performance on the same day at the London Palladium. On November 3 1952 she was invited to appear at the first Royal Variety Command Performance at the Palladium of the new reign to be attended by Her majesty the Queen, the Duke of Edinburgh and Princess Margaret. For this memorable occasion she wrote the Britannia Rag which she now played on her now famous other piano to close her act. She hoped the Royal party would enjoy the novelty of being entertained on such an ancient instrument, and it seemed she was right. Afterward she had the honour of being presented to Her Majesty, the Duke, and the Princess; and the Queen told her that she enjoyed her performance and wished she could have heard more. Both the Queen and Princess Margaret are extremely talented pianists themselves and Winnie was extremely delighted when Princess Margaret graciously commented on her records and told how she enjoyed them. By now, ALL her records were proving to be top sellers. She became known as the girl who never makes a bad record and the record company knew that whatever she recorded would sell because the public at large would simply ask for any of her records. In 1953 after making fifteen records for Decca including her own Coronation Rag to celebrate the 1953 big event, she signed a recording contract with the Phillips Recording Company. In late 1977 Winnie’s husband Lou passed away. He always said he had to protect Winnie and said she was incapable of telling a lie. She sadly passed away in Manly Hospital, Sydney on Feb 28 in 1983 following a fire caused by an electrical fault in her Ocean Street, Narrabeen Apartment.